On his way to a Peace-building and Reconciliation Consultation in Johannesburg, the World Council of Churches general secretary stopped off to visit a man who knows about peace-building South African Nobel Peace Prize laureate Desmond Tutu. WCC general secretary, Rev. Olav Fykse Tveit, went to Cape Town to talk with Archbishop Emeritus Tutu, the former leader of the Anglican church during the turbulent apartheid days. The meeting with 1984 Nobel Peace Prize laureate Tutu was on 7 June, Tveit visited today Robben Island and the cell of prisoner 4664, Nelson Mandela, who spent much of his 27 years as an apartheid prisoner there, the WCC said June 8..
Tveit and Tutu discussed the role of the WCC, the situation in South Africa, which has important local government elections this year, Africa in general and the conflict in Israel and Palestine. From 1978 to 1985, Tutu was general secretary of the South African Council of Churches, which was at the forefront of the struggle against the racist ideology of apartheid and a thorn in the side of authorities. While Tutu was unflinching as a critic of apartheid he has also been scathing in recent times of South Africa's governing African National Congress, saying that the party and President Jacob Zuma have let down those who fought to end apartheid. Tutu said his former ally Nelson Mandela had a nice house but did not spend milllions of dolars from State coffers on himself and has criticized Zuma's spending of State funds on his luxurious home at a rural estate while many of his compatriots live in poverty. He said that the party's inability to deal with corruption in its senior ranks had betrayed the aspirations of those who fought to bring down apartheid, The Times (London) reported. On June 7 the two church leaders discussed the refugee situation in South Africa where some 300,000 people from other African countries seek refuge, but also where xenophobia rears its ugly head in anti-migrant sentiment periodically. "They gave us shelter when we needed it in our struggle," Tutu told Tveit in a reference to how many African countries accepted exiles from South Africa during the time of the struggle against apartheid. 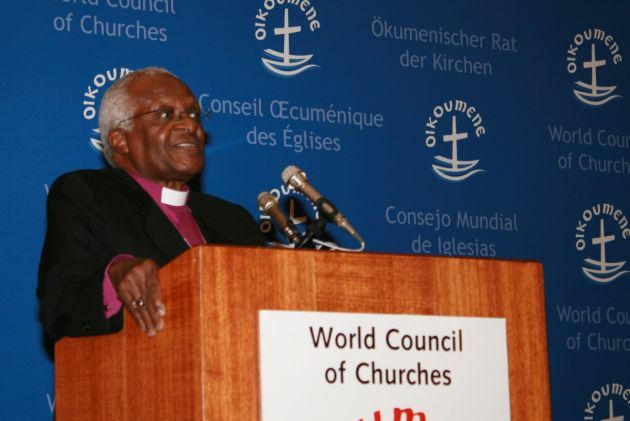 In his conversation with Tveit Tutu spoke about the WCC noting, "We would never have won the struggle [against apartheid] without the support of the international ecumenical family." "We also talked about new expressions of racism in all continents, particularly about the situation in the United States," said Tveit after the meeting. "He [Tutu] shared some of his reflections about what a truth and reconciliation process can contribute in terms of another language to deal with such conflicts." In 1996, Tutu was appointed by then President Nelson Mandela to chair the Truth and Reconciliation Commission, a body set-up to probe gross human rights violations during apartheid and seen as playing an important role in preventing a post-apartheid blood-bath. Some victims of apartheid have said, however, the commission let too many perpetrators of crimes and atrocities during the aprtheid era off the hook. Commenting on racism Tutu told Tveit, "What we learn from human history is that we do not learn from human history." Tveit commented, "It is always inspiring to listen to and talk with Desmond Tutu. He carries both the legacy and the vision of our Pilgrimage of Justice and Peace with us. "His experience, wisdom and not least his spirituality is a great gift to the ecumenical movement as we work for the unity of humanity and the unity of the church in every corner of the world." Next stop for Tveit is Soweto in Johannesburg, once a black dormitory city in the days of apartheid, where Tutu and Mandela both lived. From 8 to 11 June the general secretary will attend a consultation entitled "Peace-Building and Reconciliation Consultation: The Place of the Church" in Soweto, the place where black children rose up against inferior apartheid education in 1976. The consultation is jointly organized by the WCC and the SACC to provide a safe space where churches who come from conflict or post-conflict countries could engage in a mutual questioning, challenging and learning for improved participation of the churches in peace building and reconciliation among the churches and in the society. Church leaders will be challenged to take a proactive role in engaging in and supporting initiatives for peace-building, justice and overcoming poverty. The consultation will have 30 participants representing WCC member churches from Burundi, Colombia, the Democratic Republic of Congo, Nigeria, Palestine, South Africa, South Sudan and Sudan. Other ecumenical organizations will be the ACT Alliance Regional Forum, SACC, specialized ministries engaged in peacebuilding, WCC member of the Commission of the Churches on International Affairs (CCIA) and WCC staff.